Super Builders at Mini-Comic Con! Last weekend, the Bloxels team assembled at the St. Louis Public Library Downtown to celebrate the Mini-Comic Con and build some awesome video games with the many comic book heroes and villains that attended! Our booth was filled the minute we started setting up! There was never a dull moment during the Con. 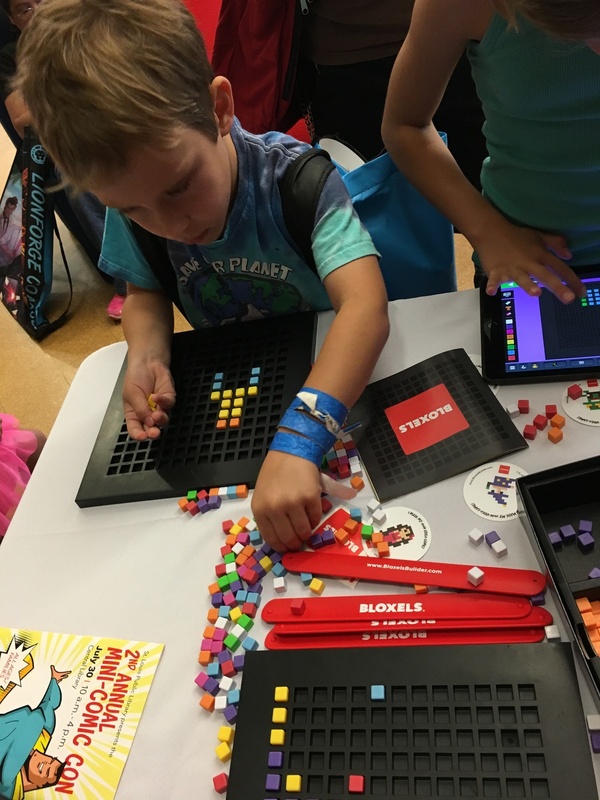 Countless kids and kids-at-heart flocked to the Bloxels booth to see what all the buzz was about, and were immediately hooked. Many folks even visited the booth more than once, continuing the game they started building earlier! Parents were shocked when the kids would ask to stay longer at the booth when there was a whole convention still waiting to be experienced. "Five more minutes" turned into 20+ for most, and some moms had to pull the kids away from the Bloxels Booth so they could see the rest of the Comic con! We had a blast building with you all Comic-con goers! Big thanks to the St. Louis Public Library for hosting the super awesome Mini-Comic Con!